How do bloggers make money and how do they reach such high blog income reports each month? There are bloggers making over $200,000 per month. How is that even possible? Below I’ll dive into 50+ blog income reports and give you the tips you need to turn your blog into a business too! How long does it take before you start making money with a blog? Weeks? Months? Years? And does the age of a blog have an impact on income? Those are the questions I think about before falling asleep. And I’m sure you do too. You’ve invested a few dollars and started your blog because you want to make money. But when will you see a return? We live in an inpatient society. I want to make money today. I want to retire tomorrow. And I want to move to Hawaii, or in my case, the French Riviera, this weekend. I want to wake up every morning to the sound of church bells and French accents. I want to walk to the corner cafe and drink an espresso. And spend the rest of the day visiting antique churches, walking down cobbled streets and drinking wine until the sun sets. But I have children and I’m a mom and those dreams will have to wait. Until then I enjoy playing on the floor with my toddler and cuddling my baby…..and working on my side hustle. If you want to see my personal income reports, you can find them on this page. 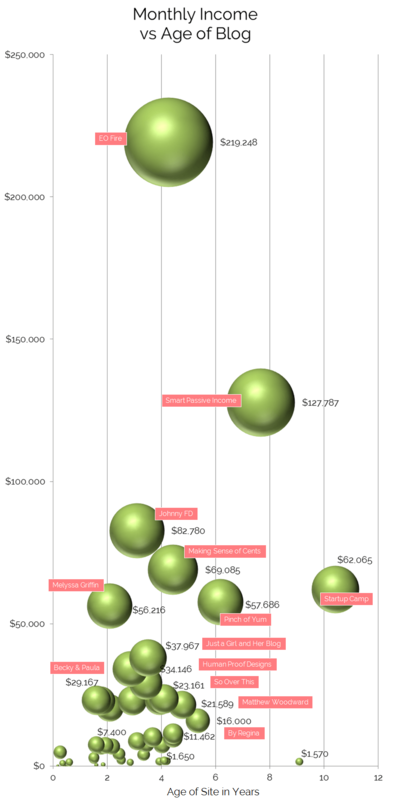 So How Long Does It Take Before Bloggers Make Large Incomes From Their Blog? Not as long as you think. Imagine starting a business the old fashioned way. You have an idea. But you don’t even know if it will work or not. But you love it! You design your product and get a patent ($5,000-$15,000). You get a manufacturer and make hundreds of your widget (cost of manufacturing can be tens of thousands). You rent a store in the nearest strip mall ($120-$200 per square foot for rent, if you’re as awesome as Apple). You run a few ads in the local paper. And then you wait. By this time you’ve invested thousands into your business and you have yet to make any income! Where are your customers? Slowly they drip in. After years you finally start to make enough money to pay all of your expenses and you can stop eating ramen noodles. Sure, that is a bad scenario, but it is very common. Is Blogging A Faster Way To Make Money? Now imagine you start a blog today. It costs you under $50 for an entire year of hosting! And that is the only expense you have to start your blog. That’s it! You can immediately start and sign up as an affiliate for Amazon and promote the products you love. Within a few weeks you can easily make back that $50. Read how these bloggers made their first $100 with their blogs. If you’re not building an audience online you are missing out. Just imagine there are hundreds of people waiting outside of your store who can’t wait to buy your product. That is what having a blog is! Even if you don’t have a product or an idea yet. It will come. And when that amazing idea strikes, you’ll have a huge email list and a blog with thousands of visitors. Then you can pitch your product and make a full time income. All from the small cost of starting a blog. So if you’re just starting or you have a blog and need inspiration. Just keep at it. Keep posting consistently and grow your audience. Test new ideas. Try new courses. Invest in amazing education, like the Blog by Number course. If you stick with it, it will pay off. Or even enroll in my free course to help you discover what to blog about and get 8,000+ blog post ideas. You’re welcome! 53 Blog Income Reports – The List! Included in this list are the big guys that you should get familiar with and learn from. People like Pat Flynn and Michelle Schroeder-Gardner – super down to earth but hardworking and smart! You can see from the chart that they have worked for years to build their online businesses. It did not take decades and a huge team. It was hard work and long hours. But building an online business can pay off royally. Think You’re Too Late? No! Be Inspired! If you’re just starting out, don’t fret! The internet is not that old! And social media is changing every day. So there are thousands of opportunities for you to grow. Find your strength, pick a niche and conquer one type of social media. Build your audience so that you can launch your big idea and make thousands from your online business. It’s not free work. It’s not easy. But it is SO possible! And the growth is exponential! If you need ideas to make money blogging or just blogging tips, my site is full of them. So start your blog today and let me know – I’ll be your first follower! Thank you so much for including us in your list! I LOVE seeing what other blogs are doing and how many people are being so transparent with their income. We’ve actually only been around for 2 years in October. 🙂 We started October 2014. Jennifer! Thank you so much for your comment! It’s awesome that so many bloggers are open about their monthly incomes. Thank you for inspiring others to follow their dreams! And I’ve updated the age of your blog to 2 years 🙂 thank you! This is awesome Suzi! We write similar things to a similar audience, so I’m always wondering what you’re up to! Thanks! Thank you for including us in your report! I just published our June report, and we made over $191 last month. Hopefully we keep going up! Not up there with the big guys, but it is inspiring to see what they are doing! Thank you for taking the time to put this impressive list together! I follow several. Love all the girl power! Thanks for including me!! I chickled when I saw myself at the bottom because that is basically why I started reporting. You have to start somewhere right!? Love the range! Of course! I’m so happy you’re on the list! And for anyone beginning a blog, it’s great to see that all bloggers have to start with the small checks 🙂 Thank you for commenting and stopping by! Thank you for including me! This list is so inspiring! Of course! Thank you Chonce!! Thank you for including me on your list. I love reading income reports because they are so varied and diverse, and now I have a huge list to choose from! Mindy, so happy to feature you! Congrats on your amazing success! What mistakes would you wish you avoided if you had to start over today? Thank you for putting me on the list! I love that you included the ages- such cool information to dive into. Thank you Lauren! I’m so happy to feature you! And congrats on a successful blog!! Wow, awesome list! This must have taken forever 🙂 Great job! Thank you Claudia! It took a while to put together. But it was all worth it! Thank you for your appreciation! Just found I was included in this. Thanks so much for adding me in, it’s appreciated! Of course, thank you for being so transparent with your income! Hi Suzi, what a great resource! 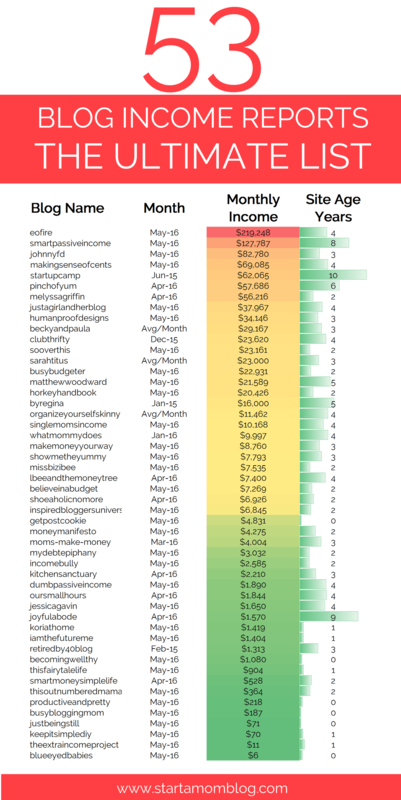 It’s so interesting to see where other bloggers fall on the income spectrum. It’s definitely inspirational to see how much you can make with time and dedication! I’d can also share more info with you if you’d like. Thanks!! Lotus, I’d love to include you! Just send me a quick email with your link and a brief description! 🙂 suzi at startamomblog dot com. Thank you!! Wow, Suzi, so much work! Thanks for compiling this, it is so inspiring to see what people are making online. You did an awesome job gathering this data. Thanks! O GOD! This is really working for me. I just organized my income report. Thanks Suzi!! Amma, thank you! So happy this helped you!! Thank you for stopping by! I really needed this right now. Thank you for making this post. Sending huge blessings to you & your blog. Thanks for sharing. I’m a newcomer and would of be additional tips. This post is so motivating! Reading income reports is actually what inspired me to start my blog and share my own income reports during my first year of blogging. If you ever update this post, I would love to have my income reports featured. My latest income report is https://www.bloggingherway.com/august-2018-blog-income-report/ which I published at the end of my first year blogging!